What do you get if you cross an eagle with a lion? Well if you’re a scholar of ancient Greek and Persian mythology then you’ll know that you end up with a Griffin, a legendary creature with the body of a lion and the head and wings of an eagle. As an extra bonus it would keep guard over your gold and treasure. 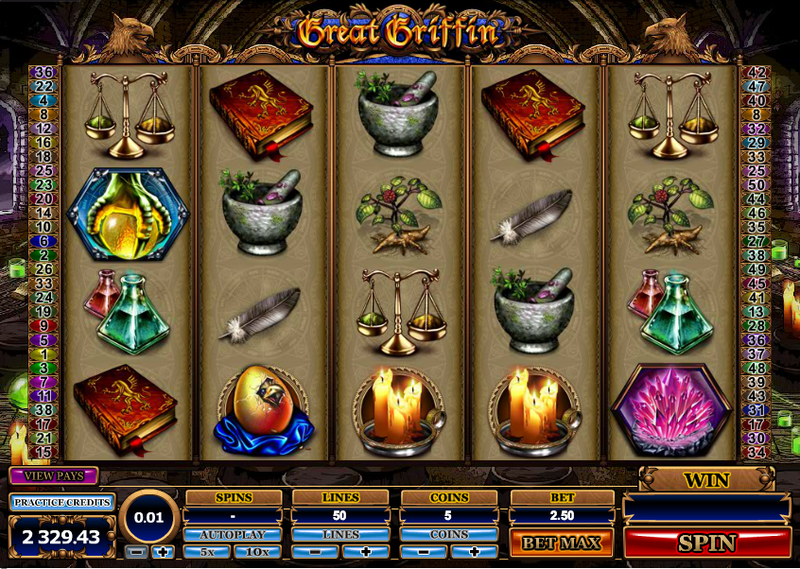 The Griffin clearly deserves to be the theme of an online slot and fortunately Microgaming have come up with the goods in Great Griffin. 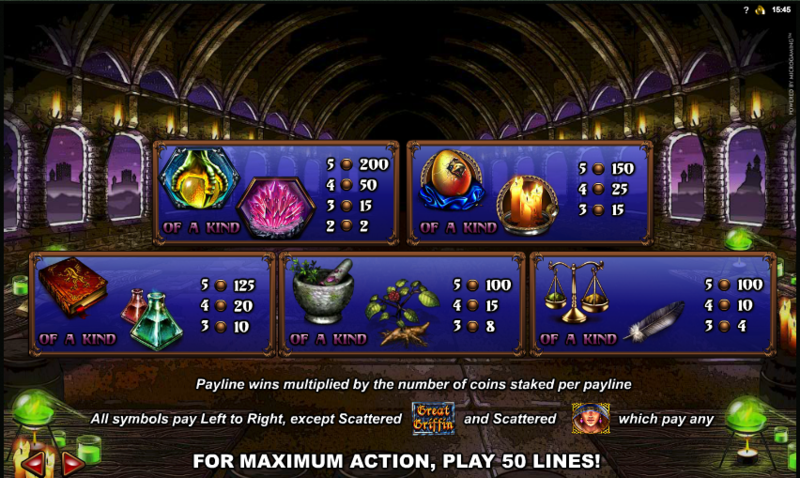 Great Griffin features five reels and a hefty fifty paylines; it’s a very gothic looking game set within vaulted stone halls and the symbols appear to be related to the Griffin or other aspects of magic. Hence we have items such as a feather, weighing scales, a mortar and pestle, potions in jars, a spell book, candles and a Griffin’s talon gripping an orb. The bonus symbols include a flying Griffin wild, a Great griffin scatter and a hooded lady who triggers the ‘Pick Me’ feature. During this feature you may land three more scatter symbols and if you do the potion meter will fill up; once the spins are finished, if there is anything in the meter, you will get to go through the choosing process again. After any spin there’s a possibility that the Griffin will fly across the screen and drop more wilds onto the reels – any winning combinations will now be doubled. When you trigger the free spins we recommend going for the fifteen spins with the 3x multiplier; this will give you more spins in which to re-trigger the spins or activate the Pick Me bonus. This is a really good looking slot with some quality artwork and topnotch animations, particularly when the Griffin flies across the reels. There’s lots of bonus features which should suit anyone who likes all the extras and let’s not forget the stylish sound effects.